writing | Blog Abandoned, it weeps. Several years ago in my crazy head popped, Knod Knowingly and the Land of Neverbodies. Yeah, that was it. What am I going to do with that? Like everything else, sit on it for several years and talk about writing the story of Knod Knowingly. Last November a couple of friends signed up for National Write a Novel Month. You attempt to write a novel of 50,000 words in 30 days. I was unemployed, had TONS of time, when would be a better time? 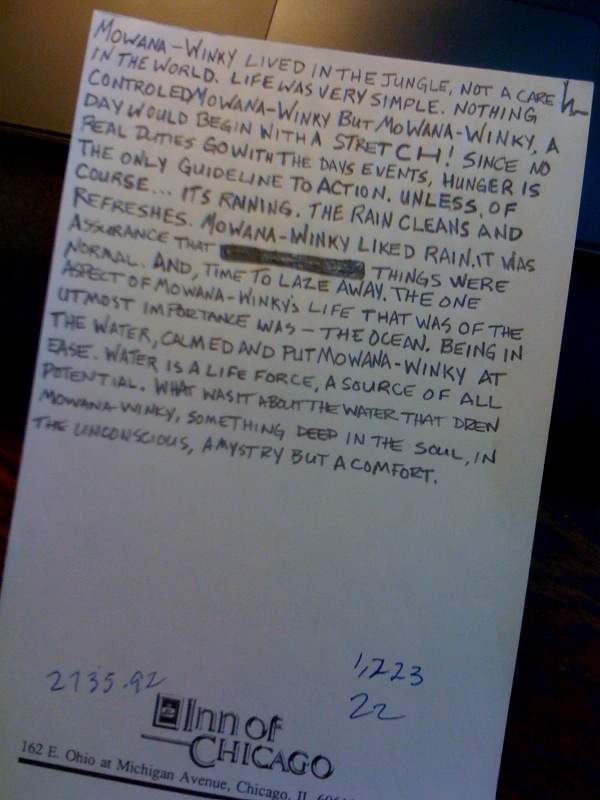 Well as confessed to in an earlier post on my blog, I was about 40,000 words short. But it was further than I’ve ever gotten before. And about 5,000 more words that my two friends who said yeah, join us it will be great! We can get together and have writing nights! (insert cricket sound here) I love ya anyway!! I was a little disappointed that I didn’t stick to the plan of 1,666 words a day. But I think that I have, as one friend said, a good framework for the story. And on the Science Channel this week I heard something that may have given me the extra element that I was looking for. Only it isn’t going to be what you might think as you read through the some excerpts to set the scene. I’m hoping with this post that I can get back on track with this new information and hit that 50,000 words before this November (sooner I hope), so that I can start fresh this year. “Knod Knowingly was the first grandchild of his Father’s parents. This afforded him some luxuries that later in life he would think weren’t worth their emotional weight. When I decided to have the Knowingly’s be on an island I went to Google in search of just that. The idea is that Knod’s Great-great-grandparents, with several other families board a boat for America in the late 1700’s to early 1800’s. A storm throws them off course and the boat is grounded on an island. It’s not the “perfect storm”, just one bad enough to throw them off course in the night. Google maps, Ireland then zoom out. See those dots near the bottom toward the right side of the box? Just west of Portugal. Flores Island. What they soon realized was that they could build shelter and homes faster than getting the boat sea worthy again. The Island of Flores was discovered in 1450 by Diogo de Teive and his son Joao de Teive. But since this is my story, this group of people discovered it by accident and grounding. They scoured the island while hoping for rescue and found no human live. A few of the men after their expedition around the small island to look for life or help, they returned to the site of the wreck to begin repair on the boat. It was a beautiful island so repairing the boat was a slow process. Not just because it was beautiful sunny and tropical. In order to repair the boat, tree’s and to be cut and planed, etc. And this took time. It was decided since they were the first and no body had ever lived here they named the island Neverbody. What they didn’t know, because it was deep in the heart of the island, that there was human life. Now this, for me is a recent development because of that Science Channel show. On the isle of Flores The Mystery of the Human Hobbit, It was the most striking scientific discovery of last year. An entirely new species of mini-human found on an island in Indonesia. Is the hobbit a new species that transforms our view of evolution, or is it simply a very small, modern human being? Yeah, no I’m not trying to channel Tolkien. Maybe I should read Tolkien so that I don’t cross hairs, mix stories or mythology? I did see some of the movie. So I am most certainly doomed to some similarities. All the more reason to read Tolkien so I can be ever so careful to stay away from it! Damn! The idea of hobbits is very appealing in a weird way. Not for what they represent, but for another layer in the story. What is driving me is the relationship that Knod has with his family, in particular his Great-Grandmother and how he continues to question and explore, but never really find answers. I had some friends read it back in December. Thank you! I don’t think they were just being nice? So it gave me a boost to continue. But how…? I don’t know if I add more to the middle or keep going moving forward? Well I guess I have that hobbit think now that can sort of fill in the middle? I certainly have more time to write now that I’m not a slave to Twitter and Facebook! Crazy things!! 139 hours and counting. I might login tomorrow and see what’s up. It’s been a week. Here’s another excerpt to share. The Uncurious Adventures of Knod Knowingly by Jennifer M. Green is licensed under a Creative Commons Attribution-Noncommercial-No Derivative Works 3.0 United States License. 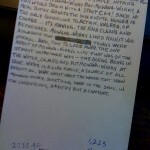 1 comment	| tags: fiction, hobbits, NaNoWrMo, writing	| posted in creative, don't speak...don't speak!